We are a chef-driven restaurant. Our passion for food and fine dining comes first for our guests. We invite you to join us for an unforgettable culinary experience. Kelby Muehlfeld’s passion for the culinary world began with a sixth-grade school project on Emeril Lagasse. He fell in love with the restaurant industry and the idea of becoming a chef someday. After receiving a degree in Culinary Arts from Hocking College, Muehlfeld began his career as a line cook and later joined the Cameron Mitchell Restaurants (CMR) team in 2010 as a supervisor at Marcella’s. Over the years, Muehlfeld has worked as a sous chef at various CMR concepts, including Molly Woo’s, Cap City Fine Diner and most recently, Hudson 29. 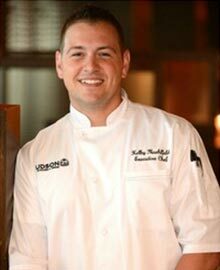 In 2017, Muehlfeld was promoted to executive chef at Hudson 29 in Upper Arlington. Muehlfeld was named the Columbus Lamb Jam Champion in 2013. His advice to aspiring chefs is to be adaptable in an ever-changing industry, stay positive and always give 100 percent in order to achieve your goals.